Laid Off Loser: Laid Off Loser Album of the Day: "A Rush of Blood to the Head"
Laid Off Loser Album of the Day: "A Rush of Blood to the Head"
"How the Discount Bono Inspires Greatness in the Average Man"
In this post-everything world, where detached cynicism is the new hope, the Average Man needs an idol in his own Average image, and Chris Martin, purveyor of anthemic modern rock, is that man. When he's not the Discount Bono or Mr. Gwyneth Paltrow, Chris Martin is Chris Martin, a dude with a name that's so un-rock star, Average Men around the world can feel a little better about themselves. 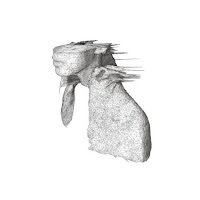 A Rush of Blood to the Head, Coldplay's second album, is a record for every Average Man who has ever bought a Stratocaster with a girl in mind — nearly an hour's worth of anthem after fist-pumping anthem that has helped keep alive the amateur art of the behind-the-wheel falsetto. Perhaps it's the nasally imperfection in his flawed-angel vocals or his Average Man handle, but Chris Martin — say the name to yourself and relish the averageness of it — sounds believable on a ballad like "Warning Sign" because he's probably been there, too. And when he executes his best bedroom-Mick swagger on "God Put a Smile Upon Your Face," it's nothing short of a victory for every Average Man who's never been able to dance in public. Rush came on the heels of Coldplay's hit debut Parachutes, an above-average modern rock record with enough hooks to bait an American audience that mostly overlooked similar efforts from across the pond (see Doves' Lost Souls). Though Parachutes — dismissed by some as Radiohead-lite — showed promise, few expected the maturity of Rush, a stronger-than-it-should-be second set of soaring 21st Century rock. With Rush, Coldplay delivered their Bends and established themselves as the leading candidates among Earnest Young Men with Rock Bands for the title of New U2. Radiohead, thankfully, got Weird after The Bends and took a Floydian turn toward foreboding man-against-machine politica. Bono and Co. have tried to be the New U2 by bringing back the Old U2 (reference All That You Can't Leave Behind, which had enough liquid Edge guitar riffs and lighter-ready anthems to come off like The Joshua Tree with a head cold), but problem is, Average Man long ago lost touch with Bono. It's hard to believe Love Hurts for a guy who hangs out with presidents and gets away with not using his surname. Chris Martin, on the other hand, will never be known as Chris (hold the surname), no matter how many Gwyneths he beds, just like no one — with the possible exception of your mother — will ever refer to you simply as Dan or Joe or hell, Chris. Like the Average Man, Martin's trump card is dependable humility — the strength of Rush is not its flashiness or complexity but its lack thereof. You can buy a line like "The truth is, I miss you" coming from a guy named Chris Martin. Chris Martin is a vessel for we Average Men. He makes it easy to believe, at least for the duration of the album, that we too could be Chris Martin, purveyor of anthemic modern rock. And for Average Men to see Chris Martin conquer the charts and the heart of Gwyneth alike is downright inspiring. It gives us hope that, maybe one day, we'll do something semi-spectacular before we die. If the Discount Bono can do it, so can we. I like this review. "It gives us hope that, maybe one day, we'll do something semi-spectacular before we die." Good on you Chad. "God Put a Smile ..." does have swagger--even with horns a la Mark Ronson's redo.